Call us today for your Special Price! ESI's BeneFIT Series Premium Electric Adjustable Table Base for 90° Corner Work Surfaces is among the best of the best - exceptional height range, smooth and quiet operation, a concealed crossbar design and a variety of sizes make this base ESI's premiere offering. With an adjustable height base, workers stand rather than sit at their table or desk, circumventing the damage to the human body by sitting for long periods of time. The three C-leg configuration of this Premium Electric Base features a concealed crossbar to provide knee clearance that will make it comfortable for just about anyone to use. The base also includes an adjustable glide for precise leveling, an essential aspect of the base's setup (base ships unassembled). It is available in silver finish only. 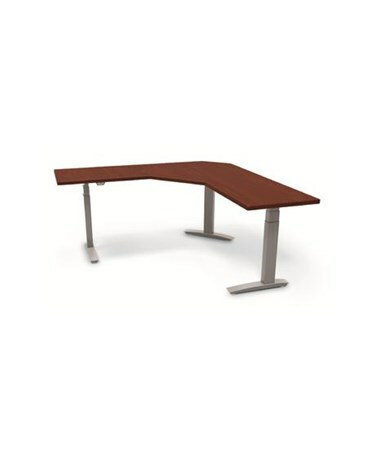 With a height range of 22" - 48" (for a total travel range of 26") and an inch per second adjustment speed of 1.5" (activated by an easy to use control pad featuring an up/down switch), finding a setting that's right for you is easy with the BeneFIT Series Premium Electric Adjustable Table Base for 90° Corner Work Surfaces. This base even exceeds the ANSI/HFES standard, which requires a base range of 22" - 46.5". The base has a rated voltage of 120V, 60 Hz and rated power of 200 Watts. Its max power consumption is 10 amps fully loaded, and it uses a mere .3 W in standby mode. The base has a lifting capacity of 220 lbs (with overload protection at 225 lbs). The steel used in manufacturing the base is produced from mills that use Basic Oxygen Furnace (BOF) and Electric Air Furnace (EAF) processes, which use a significant portion of scrap metal. This recycled content can count toward LEED credits. BOF uses 28.9% recycled content while EAF accounts for 31.4%, adding up to 72.6% available for LEED credit. The BeneFIT Series is covered by a three-tier warranty: 2 years for electronic components such as control boxes, hand switches and motors; 5 years for mechanical components such as crank drives and spindles; and 10 years for structural components such as cross-channels, feet and top supports. 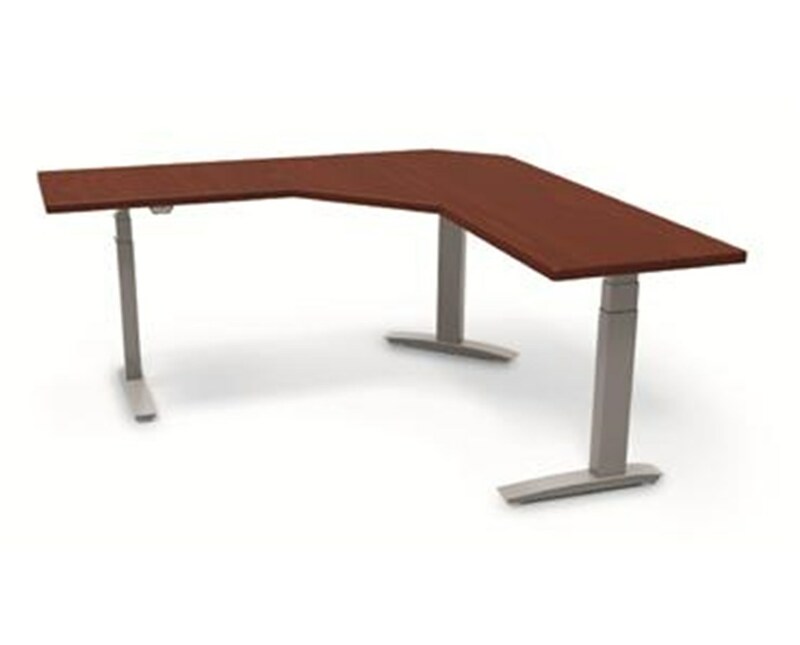 We offer ESI's BeneFIT Series Premium Electric Adjustable Table Base for 90° Corner Work Surfaces in 14 work surface sizes, listed in Side 1 x Side 2 x D format (shown in the diagram below). Select from the drop down menu above and order online direct by clicking "add to cart!" Adjustment Range 22" - 48"